My friend was chatting to a girl he knew liked him because he was a bit bored and I suspect horny. He had no intention of getting with her and did explain to her that this was just banter. But he knew that she had a crush on him. I questioned why he was talking to her at all if there was no intent. My theory, is that it’s an ego stroke. A crush for some reason is an emotion or state of being that I’m addicted to. I think it’s a transference of emotional energy onto another person who is often not worthy but has something attractive about them. Maybe I’m bored but my crushes are rarely visual. He just needs to be confident intelligent and funny and I’m sold. Universe, help us all if Will Smith ever becomes single. Oh wait, he’s the straight guy in comedies and outside of my 45 minute dating zone. He is safe. But there is something about my last ‘crush’ relationship that has always bothered me. Not the fact that the majority of it happened in my head but the fact that I know beyond reasonable doubt that this guy has no respect for me as a human and yet I professed to want to husband him breed with him? I was clearly in a crushed state. He is never on time for anything leaving me waiting outside venues in the cold. Now as most of you and British Gas know I am not a fan of the cold and yet he would arrive and say something stupid like “Am I late?” when he saw my face or look at our seats with disdain. Tickets that I woke up early to get from my nemeisis Ticketmaster with whom I’ve had some epic fights. But, no appreciation just lateness and criticism. Then there is the calling. I’m literal. A minute is a minute. So if London Underground say 1 minute on the tannoy or board and it takes 3 I get a bit antsy. Similarly if he says he’ll call me in a minute and that minute is 24 later…I’m not a happy bunny. that I liked him. Before this his behaviour was impeccable. There were no stunts being pulled but then when he knew my emotions were engaged he decided that his only defence to my roaring hormones was to be an arse. Part of me has adult moments when I question his self-worth. Maybe he can’t like a woman who can see something worth liking in him. Or maybe he feels cheated because he didn’t get to do the hard chase. I’m still not sure why men feel cheated out of the chase to be honest. Why cuss those girls you get easily. Low hanging fruit is still sweet dudes. I don’t think the things I’m asking are things that are girlfriend privileges. I think someone should do what they say they are going to do. It’s not hard. Just call when you say you will or be on time for an event that starts at 7.30 not 8 or don’t ignore my communication when it’s something that doesn’t interest me but blow up my phone when you need a favour. But no the real thing is that he thinks that he has to be cruel to be cruel. Or he just doesn’t treat women very well. I have high standards for friendship etiquette and yet I wasn’t holding this guy to them? He had to go. He was not even a good friend. Why was I still even talking to him! 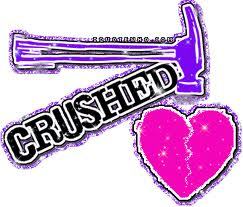 I think the way a crushee reacts to being crush on says a lot about his character. Some take advantage and others respect your emotions and go out of their way to make sure you don’t get hurt inadvertently making the crush more intense bless them. But abusive crushes I can do without. 3 strikes and you’re out because clearly insensitivity or cruelty are behaviours you are a tad too comfortable with. Yes he wasn’t crush worthy. I know this now and so with that I shed a tear for the children we never had and walk about because no one leaves this chick crushed. Well not at least without putting out once in a while first.